How far do Star Trek, Mass Effect, Portal and Halo bend the laws of physics to break the universal speed limit? In this week's long read, T3's science expert Laura Mears explores the physics of faster than light travel, quantum mechanics and string theory, as well as how these are presented in some of today's most popular science fiction. Why can't you go faster than light? It's all Einstein's fault. The faster a spacecraft, the more massive it gets, and the more energy you need to put in to make it go faster. The more energy you put in, the more massive the spacecraft gets, and the more massive it gets, the more time inside starts to slow down. But never fear, the Tau Zero foundation are working on speeding up our space travel. They say that if they matched the speed of the Voyager, they could get to our nearest star in 80,000 years. Solar sails might speed that up to a few thousand years. Rockets powered by nuclear fission could cut that down to hundreds, and fusion rockets to decades. Sadly, they reckon we'd need new physics to break the light speed barrier, so which sci-fi method is best? According to Einstein, space and time are linked as a four dimensional spacetime fabric: left and right, up and down, forwards and backwards, past and future. When mass is added to this fabric, it creates curves like the dents made by bowling balls on a trampoline. The more mass, the bigger the dents, and the bigger the dents, the more gravitational pull we feel as we go by. So if Einstein's spacetime is slowing us down, what if could bend it out of shape? The TARDIS can, and so can the ships in Star Trek. 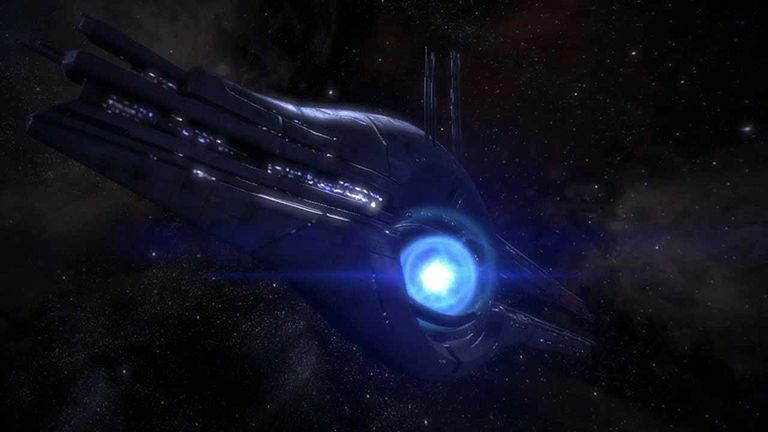 Physicist, and Star Trek watcher, Miguel Alcubierre, suggested that this type of FTL could be achieved by surrounding a ship with a bubble that kept spacetime flat inside (keeping the mass and time in side the ship normal), but squashed it outside. His hypothetical Alcubierre drive folds spacetime up in front of the ship and expands it behind, effectively bringing your destination closer and pushing your origin point farther away. You wouldn't technically be travelling faster than the speed of light, but it would feel like you were. In Star Trek, this is done by bashing matter and antimatter together in crystals made of a substance called dilithium, turning the gas into plasma to power a warp drive. Unfortunately it would take insane amounts of energy and negative mass, to make an Alcubierre drive work in real life, which brings us neatly on to Mass Relays, the next of our sci-fi hacks for FTL. If you don't want to wait to get to your destination, a jump drive might be the best mode of transport for you. These are essentially an extension of the warp drive, but they blow the speed of light right out of the water for a near instantaneous arrival. In Bioware's Mass Effect universe, it's done using element zero; a type of exotic matter that does strange things to mass and spacetime. When exposed to an electric current, eezo creates a Mass Effect field that can increase or decrease the amount of mass in any given area. And this is the key to achieving FTL. If you remove mass from the equation, suddenly light speed becomes possible. And if you make mass negative, you can go faster than a photon, zipping across the Milky Way in the blink of an eye. This tech allows Mass Relays to open mass-free corridors through space that enable travel thousands of times the speed of light. Incredibly, earlier this year, researchers at the University of Washington created a fluid with negative mass that moves backwards when pushed. They did it by making rubidium atoms so cold that they stopped behaving like particles and started behaving like waves. Then they used lasers to disturb the fluid, reversing the spin of some of the atoms and making them behave as though they had negative mass. Not quite the thing we need to power a Mass Relay, but it is an interesting tool for investigating black holes and their elusive cousins - wormholes. Which brings us on to Portal. Einstein's spacetime can be curved, so what's to stop it curling up on itself to link one place with another? Nothing, apparently. Wormholes are convenient cosmic shortcuts that sit quite comfortably with the maths of General Relativity. Unfortunately there's no evidence yet that they actually exist, but in Valve's Portal, you can open them on demand. Einstein-Rosen bridges were first hypothesised as a mathematical alternative to black holes, avoiding the singularity and replacing it with a funnel that connects one place to another. But, they're horribly unstable, opening and shutting so fast that not even a speck of light could get through. Unless, you use Casimir energy, that is. This delves into the even more brain melting field of quantum physics, and allows for negative energy and energy borrowing. More in the video below. According to Luke Butcher, a physicist from the University of Cambridge, Casimir energy might be able to hold long, thin wormholes open just long enough for a pulse of light to sneak through. It's still not enough to get Chell through before the portal collapses, let alone a whole spaceship, but the Halo universe has a solution that borrows from string theory. String theorists reckon there are 10 dimensions instead of Einstein's four. The extra ones are either wrapped up so small that we don't perceive them - a trick they call 'compactification'. Or they form a higher dimensional space called the bulk, but everything we know is crammed into a subspace called a 'brane' . Theoretical physicist Kip Thorpe explains in the video above. In science fiction, these extra dimensions make up a hyperspace that essentially runs alongside normal space like a motorway, only without all of the inconvenient laws of physics that normally slow us down. And this is how the ships get around in Halo. In their universe, there are 11 dimensions of 'slipspace', and they don't obey the rules Einsteinian physics or Euclidian geometry. With the help of a Shaw-Fujikawa Translight Engine, the UNSC create microscopic black holes that allow them to jump in, travelling from one place to the next via a different dimension. Sounds like complete fantasy, right? Well, not quite. CERN are actually looking for evidence of extra dimensions by searching for tiny black holes, which, just as in Halo lore, would disappear within fractions of a second of popping into existence. Sure, completely new physics is a bit of a leap, but science fiction predicted moon visits, cloning and headphones., so we're holding out hope that they'll be right about FTL too.